Are you inTERESTED in locating your business in West Alabama's premiere shopping destination? For more than 30 years, University Mall has offered the area's largest collection of stores under one roof, including Belk Women's, Belk Men's, Children and Home, JCPenney, Sears, Café Court and a great selection of national and local retailers. 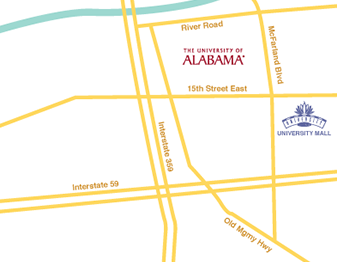 University Mall is located near the University of Alabama and nearby thriving manufacturing facilities including JVC electronics and the Mercedes-Benz plant. University Mall serves a total trade area population of 515,791 with a household income of $66,116.